Cheshire’s Police and Crime Commissioner David Keane has been on patrol with officers in Chester to receive a demonstration of the force’s new body worn video (BWV) equipment ahead of all officers being trained on the kit. 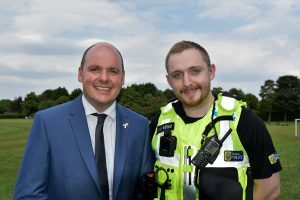 It follows the announcement earlier this year that body worn video (BWV) cameras would be made available to all police officers in Cheshire thanks to funding approved by David Keane. For the first time, the kit will be used by all frontline officers including local police units, detectives and PCSOs. Training for frontline officers began earlier this month as the force-wide roll-out continues to progress. David said, “It was fantastic to see BWV in action. From spending the afternoon with one of our Taser officers who has been using the kit for a couple of months, it’s clear to see the huge benefits this equipment is already bringing to neighbourhood policing across Cheshire. Police officers will share the devices between shifts, ensuring the introduction of the new kit is as cost effective as possible. They’ll dock the device when they return to the station from their shift in a safe and secure manner. The footage will then be automatically stored on the force’s central records.